I have decided to come back from being dormant by sharing about one of the best bang for the buck in terms of chirashii in Singapore. 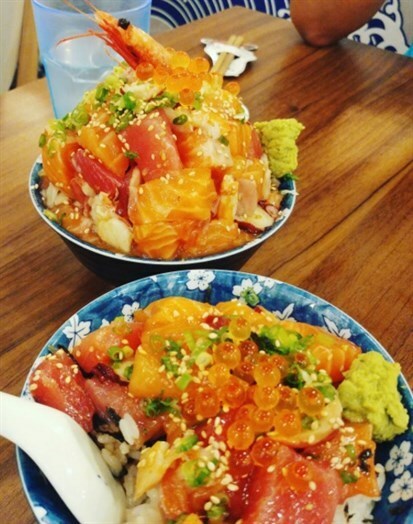 It's $12.95 for the basic Chirashii don that comes with enough salmon and tuna that probably will satisfy your craving for a while. The premium chirashii comes with the raw sweet prawns and a mountainful of rice. Honestly speaking, I feel that 2 ppl can probably share this and be full. However, as the premium chirashi is double the price of the normal chirashi, I would recommend for each party to order a basic chirashi each as there might be a better proportion of fish to rice then. It's always nice to try new places to see what types of cuisines are available in Singapore. My brother raved about this restaurant recently and we decided to go there together with a group of friends to try this restaurant out. Though it is a little inconvenient to get there by public transportation, I'd encourage you to give this restaurant a try. As we were there in a big group and my brother had called ahead of time, they had accomodated us by pulling tables together and reserving it for us. When I first arrived at the restaurant destination, I really liked the atmosphere of the place. It was warmly lit in the way that it was welcoming- not too bright and not too dark. I wished that I had remembered to take more pictures of the interior. They had different sorts of seatings: benches, chairs, and they also had a few high chairs to accomodate those in our group who had decided to bring their little ones. As they also serve alcohol and have quite a range of drink selections in their coolers, it is also a place you can consider to chill with your friends. The restaurant itself is self-service so you do need to go up to the counter and take your order. They will then give you an electronic device that will light up and vibrate when your order is done. Because they do your order on the spot, you have to be patient to wait for your food. It is well worth the wait because the food is grilled on the spot and served hot! You can also take your time in line and waiting to observe the chefs hard at work in the kichen behind. There are sauces available to the side of where you would place your order. For those that like chili, they have a decent homemade chili that puts a nice kick for you. I had the Naughty Mate as I wanted to try the ribs for what it's worth. I was pleasantly surprised at the presentation when the food arrived. The soft bone ribs arrived hot and marinated well- not too salty or sweet, but just right. I feel that there was no short cuts used in the preparation and cooking process because it really felt like they were fresh off the grill! (unlike some mainstream rib restaurants nowadays where reheat it for a bit before serving). I felt that the soft bone, however, could have been a little bit softer and it would have been even better I had requested for the mashed potato and was delighted to find out that it was made from scratch as there are tiny potato pieces and skin inside which helped with it's authentic texture. Though small, it's packed with a punch. I also liked how the salad dressing was not thousand island dressing but more similar to balsalmic dressing, hence it didn't feel very heavy. Naughty Wings (above) and Naughty Fries (below) are served with 'naughty spices' which is a nice blend of salt and pepper. They were both fried to a nice light golden brown color and I would say that they are my top 2 favorite side-dishes. For those who are more sensitive to pepper, I think it may be possible to request for them to not have it. But I have to say that it really goes nicely together. If I was there drinking with friends all night, these two dishes would have to be magically replenished all night. Seafood Platter had an assortment of seafood: squid (calamari rings), prawns, and fish. It did not come with the 'naughty spices' but a generous serving of tartar sauce. Naughty Soup $4 was recommended by my brother and I loved how long the soup was able the heat inside for quite a while. There was celery and carrots amongst the condiments inside. At first I thought it was beef inside but it was actually pork. It's quite savory and though the portion is not humongous, nice to share as well. Check out how clean our plates were after the meal! There is the option of eggplant if you would want more vegetables in your meal. Overall, the side dishes portions are great to have on the table and to share with good company. It's a nice place to chill with friends and perhaps a nice family meal once in a while. Though they sold other dishes, everyone in line was there for the rojak. Not too sure why they decided to offer other dishes cause it seems like their business was pretty good. In fact it makes you question their expertise and quality when other dishes are sold. I like watching people make rojak on the spot-- how quick and fast they are in cutting the vegetables. There were pineapples and beansprouts in this rojak, and though not a 'healthy' salad, it does make you eat some fruits and vegetables. It was a little on the salty and savory side so I needed a juice to wash the flavor down, but I wouldn't mind ordering it again if I'm back at Adam Road Food Centre and the line is not too ominous. The satay pieces are sold at $60c per piece at a minimum order of 10. The meat was succulent, hot, and tasty. Before the satay could have cooled down, it was gobbled down quickly. The condiments were pretty much unnecessary as everyone was grabbing for the satay sticks before they were gone. If you have friends who think that satay is 'just' meat on a stick, they need to try a proper satay that's marinated well. The store sells a few things that aren't very malay such as 'chezzy fries' (Cheesy fries), and mutton/chicken chop (that looks western). We ordered the Ikan bilis fried rice and it took quite a while to come, however, the plate arrived fresh from the pan and was hot. Overall, it felt rather salty, so I think it's a good idea to order a plate and share amongst other dishes available in the food court. 2) there are no price listed on the signboard, so you have to resort to asking the man who delivers your food.